"Cool cocktail with raspberry and pineapple flavors." 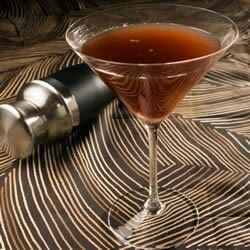 In a cocktail shaker filled with ice, shake the Southern Comfort liqueur, pineapple juice, and raspberry wine until well blended. Strain into a martini glass, and garnish with a slice of fruit. Very, very good. I felt like slipping into this drink and taking a little dip. This would be EXCELLENT for a Girls-Night-In. I used a local made raspberry wine which I think made it even better. great! didn't have any raspberry wine, so I used pomegranate wine!